12/7: "Tonight Show With Jay Leno"
12/8: "The Ellen DeGeneres Show." Do you plan on seeing Apocalypto? Vote now! When will Apocalypto be released? What language do they speak in Apocalypto? What does the Apocalypto promotional poster look like? Who is composing the soundtrack for Apocalypto? Give me the Nuts & Bolts about Apocalypto! Is there a hidden frame in the Apocalypto teaser trailer? What is the Popol Vuh? Do you have news or content related to Apocalypto? Tell us about it! We can also give media interviews. Disclaimer: This site is run by fans of Apocalypto, and is in no way affiliated with the Apocalypto movie. We do not claim any of the artwork displayed is our own. All copyrights and trademarks for any material used are held by their respective owners. We believe we are following the fair use clause of copyright law. If we are in violation of any copyright law, please email us so that appropriate action may be swiftly taken. Thank you. How to get your copy of Apocalypto on DVD, VHS & More! I am 19 years old, from Greece and I have seen a lot of movies.The only think I want to say is that the movie was simply perfect. Rudy Youngblood was somethng more than an amazing actor.Dalia Hernadez. I liked her, too.As far as the little boy concerned, I cant express with words how cute it was. Mel,and the rest of you, congratulations. You did a great job. This website has three Mel interviews by Richard Wilkins for the Australian Today Show on Apocalypto. Mel looks very, very relaxed. Apocalypto has been nominated for a 'Film not in the English Language' for the UK BAFTA Awards to be televised in the UK on Feb 11th. Go to this Australian Website for a podcast interview with Apocalypto's Director of Photography Dean Semmler. The interviewer is Julie Rigg. This website verifies Apocalypto Topping UK Box Office Opening Weekend with $1.3M. From Box Office Mojo, Italy did even better this opening weekend with $3.1M. That's all for now, but more to come soon! Much Apocalypto happenings ... here's the latest! "I'd like to inform you of the UK mag, Total Film, Feb 2007 issue. It features Mel on the cover and has an interview-based five-page article. A very good one. The perfect cover photo is here: http://bookweb.kinokuniya.co.jp/iimgdata/large/0814889.jpg"
Nathan informs us that Dec. 28th was the Apocalypto release date for Israel. "Here is a very good interview of Mel by Michael Medved about Apocalypto. The podcast can be found by scrolling down to December 15th. Mel sounds great - very relaxed: http://www.townhall.com/TalkRadio/Show.aspx?RadioShowID=4&ContentGuid=f368c22b-d40d-47d8-a8f1-c8f04b9ab24c"
Linda also tells us: "This is a good piece by Ed Driscoll on the Variety's (stretching the truth) biased article that said Apocalypto's box office was heading into oblivion: http://eddiscoll.com/archives/010135.php"
Louise tells us that Apocalypto was the surprise box office winner in Russia. Now that the Holiday Season is over we will return to regularly-updating you on all the Apocalypto-related news. Stay tuned and keep the tips coming! Thank you. Release dates for Denmark (19 January) and Sweden (23 February) - Thanks Nathan! There's a very cool podcast interview with Mel from a Denver ABC affiliate. It's a really laid back interview, very positive and Mel is informal and at his best (very comfortable, good questions). This website at Foxnews has a Sean Hannity 3 part interview on video with Mel that was done within the last couple of days. It's fantastic. Here are four new article/interviews Mel has done about Apocalypto. All very good. We'll be keeping you up-to-date on all the most recent Apocalypto news in the coming weeks! Many thanks to our generous contributors! Apocalypto has been nominated for the Foreign Language Golden Globe! Read more here. Other contenders include "Letters from Iwo Jima," "The Lives of Others," "Pan's Labyrinth," and "Volver." Apocalypto continues to be the #1 movie in America, and you've stumbled upon the #1 fansite for it! So stay tuned for all the latest news and rumors, submit your tips and comments via email ("apocalyptowatch [at] gmail.com") and voice your opinion in the comment boxes! Thanks to AW Reader Antonius Bloch for the tip! Update: The page appears to have been taken down, but you can still read the Google cached version here or above at the links provided. Final numbers: Apocalypto makes 15m opening weekend! More from the Associated Press here. More analysis from BoxOfficeMojo here. If we've missed any, please email us. Thanks! Apocalypto roars into No. 1 spot! Apocalypto Mobile store goes live! As earlier reported, Apocalytpo has a mobile store, and it just went live! Right now they have several mobile phone wallpapers available. You can also specify what phone you have to find more Apocalypto content. Apocalypto set to have bigger opening weekend than Braveheart! More statistics on Friday's opening box office take here at BoxOfficeMojo. Apocalypto is rated "R" for "sequences of graphic violence and disturbing images." Apocalypto's running time is 2 hours & 18 minutes. Apocalypto's movie trailer is viewable here. Apocalytpo has been receiving many rave reviews, here is a partial list of them. Apocalypto is currently the highest rated opening movie at Rotten Tomatoes. We recommend booking your tickets here at Yahoo! movies (non-endorsed suggestion). 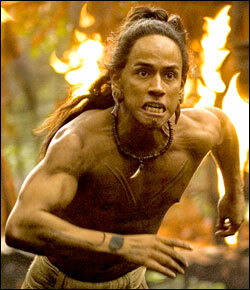 The hero of Apocalypto, Jaguar Paw, is played by Rudy Youngblood. For more information, visit his website here. For more information on the latest Apocalytpo news, refresh this page or scroll our sidebar. Apocalypto wins friday matinee wars at the box office! DeadlineHollywood reports: "FRIDAY 2 PM: Call it a Hollywood shocker. Despite scandal, an R-rating, subtitles because of an ancient dialect, no stars, and direct competition from movieland AAA-listers Leonardo DiCaprio and Cameron Diaz, Mel Gibson's Apocalypto won today's matinees this opening weekend, I'm told." "Director Mel Gibson (L) discusses his new film 'Apocalypto' with talk show host Jay Leno during an appearance on 'The Tonight Show with Jay Leno' at the NBC studios in Burbank, California, December 7, 2006, in this publicity photograph released by NBC December 8. The film which opens in the U.S. December 8, 2006, is about the Maya kingdom as it faces its decline. Chris Hason/NBC UNIVERSAL/Handout (UNITED STATES) "
More news as it comes in ... the AW webmasters have seen the movie and love it! Update: More about what they talked about in the interview here. Apocalypto currently has the highest average review rating of any major movie premiering this Friday! Roger Moore declares about Apocalypto: "I'd pay to see that." Mel Gibson's "Apocalypto" passes the only movie test that's important. It's the "I'd pay to see that" test. As in: "A blood-spattered jungle chase epic set at the end of the Mayan Empire? I'd pay to see that." RT Consensus: "Brilliantly filmed, if a bit bloody." So let's get the media blitz started! Mel Gibson: Apocalypto's "biggest asset and biggest problem"
"Apocalypto'' arrives in theaters Friday with an incongruous challenge - its auteur, Mel Gibson, is both its biggest asset and biggest problem. Gibson, 50, is coming off two major hits: the phenomenal, $370 million success of his religious epic, ``The Passion of the Christ,'' and the scandalous, anti-Semitic rant he spewed after a drunk-driving arrest in July. Oscar-winning director Mel Gibson has created the year's most anticipated cinema event with his awe- inspiring epic action-adventure "Apocalypto." Reflecting the film's dramatic sweep is Oscar-winning composer James Horner's evocative score. Hollywood Records is set to release the "Apocalypto" soundtrack CD on December 5 while the film from Touchstone Pictures in association with Icon Productions arrives in theaters everywhere December 8. Scenes of enslaved Maya Indians building temples for a violent, decadent culture in Mel Gibson's new film "Apocalypto" may ring true for many of today's Mayas, who earn meager wages in construction camps, building huge tourist resorts on land they once owned. Exclusive Clip: "In the Trees" - Jaguar Paw (Rudy Youngblood) escapes the tribesmen but falls into even more danger. In the coming days and weeks Apocalpto Watch will be receiving a huge upswing in visitors, so now is the time to secure a BlogAds on our left sidebar. You can order either exclusive Premium BlogAds [here] or Standard BlogAds [here]. If you want traffic details and trends please email "apocalyptowatch [at] gmail.com" and we can provide them ... thank you! With some early reviews lauding the audacity and innovation of Mel Gibson's bloody Mayan epic, "Apocalypto," Hollywood's tight-knit community of Oscar voters may find itself facing a difficult dilemma in the coming weeks: Will they consider the film for an Academy Award? More praise for Apocalypto from early reviews coming up next! Hear audio clips of James Horner's score! 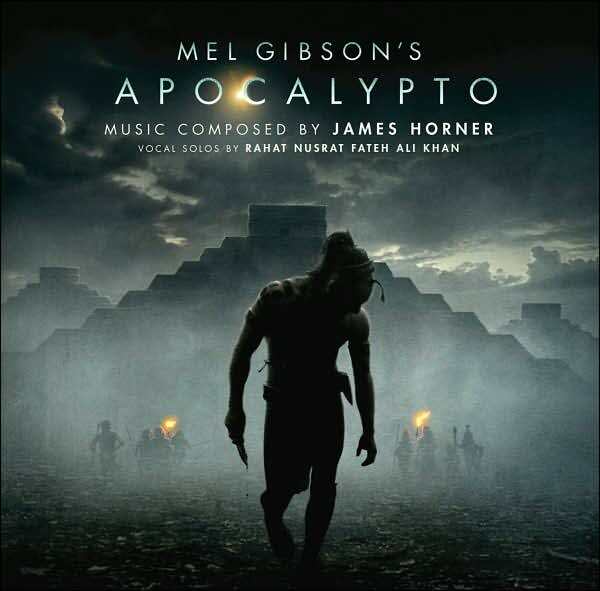 A couple readers sent in this new link over at Soundtrack.net which includes preview clips from James Horner's Apocalypto soundtrack. The soundtrack is already available from Amazon.com (here), and will be officially released tomorrow. Rudy and Raoul were looking happy at the advance screening of Apocalypto that took place in Oklahoma last Friday. Mel Gibson's effort to find an indigenous cast for his new movie Apocalypto, which depicts the end of the Mayan civilization, is drawing praise from American Indian leaders. Gibson wanted an indigenous cast for the project, so the filmmakers found people from the Yucatan, Mexico City, Oaxaca, Xalapa, Veracruz and other spots. Two of the cast members are from the United States, three are from Canada and the rest hail from Central America. "It is very important to note that Mr. Gibson has gone to great lengths to cast indigenous people in this film," Chickasaw Nation Gov. Bill Anoatubby said. "This not only helps make the film more realistic, it serves as an inspiration to Native American actors who aspire to perform relevant roles in the film industry." Gibson screened the movie Friday for a sold-out audience at Chickasaw Nation's Riverwind Casino. Tickets were $55, proceeds going to American Indian health organizations and charities. Rudy Youngblood, who makes his acting debut as Jaguar Paw, and Raoul Trujillo, who portrays Zero Wolf, arrived in sports utility vehicles and stood on Riverwind's version of the red carpet - a black carpet that led into the theater - to pose for photographers. Pictures of the Apocalypto cast can be sent (like all email tips) to "apocalyptowatch [at] gmail.com" (without the quotation marks). You're tips help keep us in action! Thanks! Apocalypto: 4 Days To Go! Over at Rotten Tomatoes Apocalypto is tracking a whopping 100%! Update: Reader Michael tells us "The one 'rotten' review (from Hollywood Reporter) is basically a positive one, it's obviously just mislabeled." Hollywood heavyweight Mel Gibson has blasted movie bosses for serving up "sequel after sequel", and insists that movie audiences want original films. Early reviews of Mel Gibson's ancient Mayan epic Apocalypto have praised its "blood-and-guts action", "breathtaking vistas" and "bruising beauty". Mel Gibson's new movie "Apocalypto" drew several good early reviews on Friday from critics who cautioned the thriller set against the end of an ancient Mayan civilization is also extremely violent. Apocalypto: 5 Days To Go! Thanks to AW contributer Antonius Bloch! Todd McCarthy of Variety praises Apocalypto! "Mel Gibson is always good for a surprise, and his latest is that "Apocalypto" is a remarkable film. Set in the waning days of the Mayan civilization, the picture provides a trip to a place one's never been before, offering hitherto unseen sights of exceptional vividness and power. In the wake of its director's recent outburst and unwanted publicity, commercial prospects remain anyone's guess, and those looking for a reason not to attend will undoubtedly find one, be it Gibson's tirade, the gore, the subtitles or outre subject matter. But blood-and-guts action audiences should eat this up, Gibson is courting Latinos, eco-political types will like the message and at least part of the massive "The Passion of the Christ" crowd should be curious, so strong biz is possible if these distinct constituencies are roused." We're hearing various times for its running length: anywhere between 2hrs and 17 minutes up to 2hrs and 28 minutes. We'll keep looking into it. Get the audience reaction: "Make no mistake, this is a visually violent picture, not one for the squeamish. In fact, several people walked out of the all-media screening I attended. But everyone else sat transfixed as the story grabbed the audience. After it was over the audience filed out in stunned silence. Personally, I was exhausted." The Gist: "This is a slam-bang, action-packed chase movie that puts the audience smack-dab in the middle of pre-Columbian America, and that's the joy of the movie. Gibson has brilliantly come as close to showing how it was before Columbus arrived as we will ever get. If you can stand the gore and violence, "Apocalypto" is a don't-miss experience." He gave Apocalypto a 10/10. "Mel Gibson's effort to find an indigenous cast for his new movie "Apocalypto," which depicts the end of the Mayan civilization, is drawing praise from American Indian leaders. Apocalypto: 6 Days To Go! Note that the tracklistings on these pages show the tracks in alphabetical order, not in the correct cd order." Several readers have said they are unhappy with Roger Friedman's Apocalypto review, calling it "disgraceful" and "full of biased journalism." "Apocalypto" surpasses "The Passion" in every way as a movie about pain, flagellation, and wounding. The grotesqueries are almost numbing, and at some point, they become laughable. But all the while, you're thinking, what's the point here? If "Apocalypto" was supposed to be about that transitional civilization, where is it? After two hours and several minutes of squirming and covering eyes, you start to think that "Apocalypto" exists just to show violence for itself. The point is lost." Several weeks ago, I posted my impressions of "Apocalypto" after seeing a rough cut in a private showing in Los Angeles. Unless Gibson decided to add scenes or modify significantly the story line, I think Roger overreacted. The film is not for children, and contains several scenes that, for my sensibilities, were over the top. But as a whole, I found "Apocalypto" to be riveting entertainment and a valuable contribution of social, historic, and moral commentary. Apocalypto running time actually longer than previously circulated? "You wrote some days ago that the film is about two hours long, and to be frank, that's what I heard too after it was screened for the first time in Austin back then. With reviews of the supposedly final cut slowly coming in ... the running time now seems to clock in at a healthy 137 mins. Has the film - that was supposed to get a little trimmed - actually got longer in the process? Hmm..."
"Blood-and-guts action audiences should eat this up," said show business newspaper Daily Variety. "Despite the subject's inherent spectacle, conflict and societal interest, Central America's pre-Columbian history has scarcely been touched by filmmakers," writes Variety critic Todd McCarthy, who also called the film "remarkable." Four new Apocalypto film clips! "There are FOUR movie clips, each in either Quicktime or Windows Media Player format! All of those clips, even for their short length really had me at the edge of my seat. You really truly get to see the amazing cinematography in the film as well as the score!" *spoiler warning* - remember, these are clips from the actual movie! Entertainment Weekly puts Mel & Apocalypto on its front cover! Yes, it's true! EW has an exclusive interview with Mel! "Gibson has a few more pounds yet to shed - the one or two tons weighing on his shoulders, to be specific. He's still explaining himself to friends and colleagues, and still hoping that his slurs (such as the one about Jews starting all wars) won't cause too much havoc at the box office when his new movie, Apocalypto, opens on Dec. 8. Unlike his last film, The Passion of the Christ, the 2004 Crucifixion saga that set off a storm of protests from Jewish leaders (and ended up grossing $370 million domestically), this one wasn't supposed to be controversial. Apart from the fact that the cast is entirely unknown and the dialogue is in the Mayan dialect of Yucatec, Apocalypto is a return to form for Gibson - an action movie filled with over-the-top stunts and breathtaking violence. Early on, a peaceful Mayan village is brutally razed by a band of warriors looking for victims to sacrifice to the sun god. A young father named Jaguar Paw (Rudy Youngblood) manages to hide his pregnant wife and son before being enslaved. After an escape the gods themselves seem to have engineered, Jaguar hurtles back through the forest in a darkly thrilling race to save his family. All the while, he's pursued by the most ferocious of his enemies. How Apocalypto fares at the box office will be seen as a measure of how much damage Gibson has done to his career, though, in fairness, the subtitles could scare more people off than anything the director said during his run-in with the police. In the following pages, EW asks the 50-year-old movie star-turned-director-turned-headline magnet about everything from anti-Semitism to the end of the world as we know it." A new variation of the Apocalypto poster, discovered by AW reader Hidai! Update: We've also confirmed that a variation of this poster is being used on many highway billboard signs across the United States. Post below in the comments box if you've seen one! The marketing campaign for Mel Gibson's "Apocalypto" continues to be as unpredictable as the filmmaker himself. Following screenings at 64 college campuses and an Indian reservation this week, "Apocalypto" gets an all-media screening tonight. It's all part of Disney's unorthodox approach to the very unorthodox film, which has been shrouded in controversy since Gibson unleashed a drunken, anti-Semitic tirade over the summer. The film opens on more than 2,500 screens Dec. 8 -- Disney upped the number from 2,000 due to an enthusiastic response from exhibitors who saw the film on Monday. There will be no splashy Hollywood premiere for "Apocalypto"; instead, Gibson will appear Friday at a preem in Oklahoma benefiting the Chickasaw Nation. Disney is also making a push with Latino and Native American [audiences]. On Tuesday, Los Angeles' Latin Business Assn. hosted a screening of the movie in Century City. But it's not entirely a renegade plan. Disney execs decided Wednesday that they will send screeners to all branches of the Academy of Motion Picture Arts & Sciences -- a contrast with the subdued, almost non-existent Oscar push for "The Passion of the Christ." And next week, Gibson will hold a press conference for the Hollywood Foreign Press Assn., arbiters of the Golden Globes. Despite such appearances by Gibson, Disney is banking on [audiences] judging the movie, not the man who made it. "I would like to have everyone -- the press, the public, the Academy, the critics -- to judge the movie and the director on the artistic merits of 'Apocalypto' only," Disney senior VP of publicity Dennis Rice told Daily Variety. "That's the best I can hope for." To this end, Disney has been aggressively screening the film for members of niche groups to whom the film will mostly likely appeal and are presumably less sensitive to Gibson's personal foibles. "It's an action genre film, and that is the demo for that," said Gibson's publicist Alan Nierob. "They love it, they get it, they cheer, they're animated." Younger auds are also less likely to be upset by the film's extreme violence. As for students' concern with Gibson's drunken rant during his arrest last summer, Nierob said: "It's not even an issue. It doesn't exist. They're looking at the film." Actor and director Mel Gibson plans to unveil his new movie "Apocalypto" during a special screening Friday in OklahomaThe movie, set for a broader release on December 8th, will be shown in a 15-hundred-seat theater at the Riverwind Casino. Gibson visited the casino in September for two private pre-screenings of the film. Gibson is expected to attend the event, which is being hosted by the Chickasaw Nation. His Oklahoma City publicist, Jhane Myers, says that Gibson previously has released his films in New York or Los Angeles. She says his decision to unveil "Apocalypto" in Oklahoma is his way of giving back to the Indian people. The ticket price is $55. Embedded Video: Three New Apocalypto TV Spots! Comingsoon.net has compiled links to all the Apocalypto teasers, trailers, featurettes and TV Spots. Here is the embedded video of the three newest TV Spots ... enjoy! Click the Play button (>) to view the videos. Thanks to reader Josh for the tip! Reuters: "But there are a few other unknown quantities that could swoop in and earn one of the five drama nominations. Perhaps the biggest question mark is Disney's "Apocalypto," the Mel Gibson Mayan adventure that takes place in a dead language and features a cast of unknowns...A few early screenings of "Apocalypto" did seem to suggest that it had something unique to offer, though, and if "Passion" proved anything, it's that the industry shouldn't discount what might seem like a wholly unmarketable project." McClatchy Newspapers: "Apocalypto: Curiosity is high around this subtitled, action-heavy historical drama about the ancient Mayan civilization..."
Variety: "But the word has seeped out: From Gibson's troubled mind has emerged yet another brilliant exercise in filmmaking, extremely violent, yet compelling. The inner demons that play havoc with his personal life continue to energize his creative vision." The Wikipedia text you have for Rahat Nusrat Fateh Ali Khan is mistaken. You accidentally took the bio of his uncle, Nusrat Fateh Ali Khan who died in 1997. Rahat is his successor in this spiritual form of Sufi music called Qawwali (which finds its home in Pakistan and India). James Horner used Rahat in the score of "The Four Feathers." Although in "The Four Feathers" he was used more "intensely" than typical Qawwali, you can see him performing Qawwali here [YouTube link]. There is a short bio of him at Wikipedia here and Answers.com here. Also, this website has some good information. It will be interesting to hear how Horner uses him in "Apocalypto" since he has a distinctly Persian/Indian sound. But as I said, in "The Four Feathers," he sounded very intense and ancient - though that film was a British and Muslim film so he fit perfectly. Nevertheless, if he's used properly (which I'm sure Horner has done), he will bring a very "dark and ancient" feel to the primitive sounding score. Thanks for the excellent research, Antonius! Total Playing Time: 60:33 You can order a copy of the soundtrack from Amazon here. Keep sending in those tips! Update: Another version of the Soundtrack covere is viewable here.